Everybody has this desire to see success in whatever they do and this can be achieved if that event or activity is started in an auspicious or benefic time. This auspicious time which will give that extra boon in your life is called Muhurat. It is always a good practice to find out the right Muhurat (favourable time) before starting any important event, this will ensure the success of that activity or event without any obstacles or disturbances. It is said that whenever a task is started in shubh muhurat the chances of a successful result is maximised. It is will negate all the bad vibes that might be associated with that activity. One can be either strong or weak depending on their time. If ones time is bad no matter how much they try, all their activity will result in failure, likewise if their time is good, even major obstacles would somehow get fixed on its own. As such one should give the utmost importance for a good time i.e Muhurat before starting any new venture or event like marriage, naming ceremony, building a house, buying property and so on. How To Find Out The Right Muhurat? Many might get any idea that this would be a tedious work, or even complicated. On the contrary this is quite simple, if the right method is followed. AstroSage has some great tools that could come to your rescue. 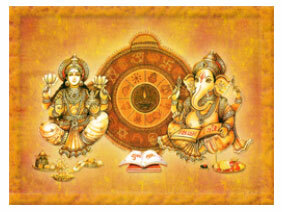 These tools are so user friendly that, you need not have a astrological background to use it. Choghadiya is a term derived Sanskrit. It consists of 2 terms Cho meaning four and Ghadi (also spelt as Ghati) meaning hour. Here the value of 24 hours is equal to 60 Ghati. Further, the value of each Choghadiya is equal to 3.75 Ghati, which approximates to 4 Ghati. Hence the name choghadiya. This will help you to decide on which particular choghadiya suits you to start your work. The time duration which come under planet Rahu’s influence is called Rahukaal. This time (Rahukaal) is considered inauspicious and any new venture or suspicious work should be avoided at this time. So, that all for this week folks. We will keep updating you with more interesting news. For more information, stay tuned to AstroSage.com.